Very often, we debate with ourselves over whether we should or shouldn't do a thing. We grab a coin, flip it and say, "If it comes up heads, I get to do the thing!" It seems that the chocolate cake or evening antics are always distant, though, because it's always tails! It is tough to give yourself permission to give into those vices, but when a coin always lands heads up, it is like constant permission to do anything. No wonder Two-Face, with his double-headed coin, is just a bit of a lunatic. What an idol! Just say "Yes" to things when you've got this Two-Face Replica Coin from the DC Universe. 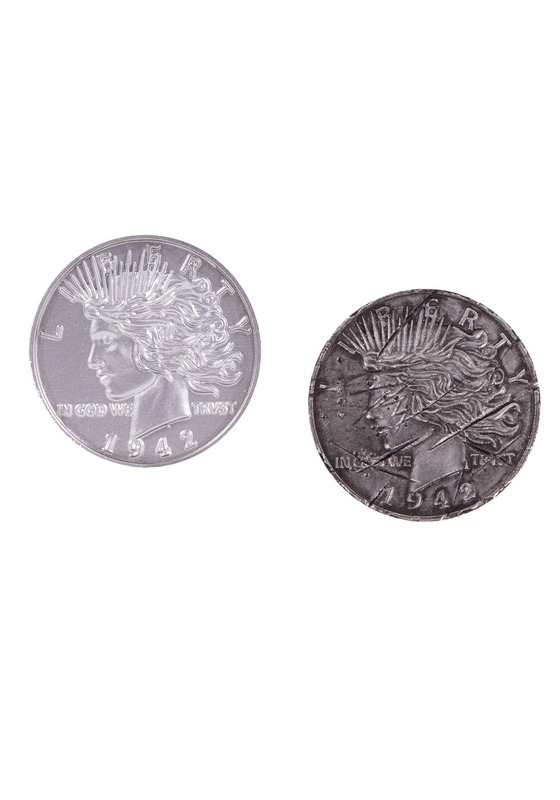 This double-headed liberty coin shows the 1942 year and features the proud heads up face on both sides. One, however, is scarred and dark just like the dangerous side of Two-Face's personality. Tempt fate and know you'll always be on the winning side with this! While it might be nice to know that chance is always on your side with a double-headed coin, be aware that Two-Face's Coin does have a bit of a dark curse about it. Even those optimistic results tend to be bad for someone... even if it is just your enemies.